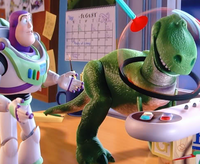 The Pixar logo fades in, and that white desk lamp jumps on the I, squashing it. Everything fades out except for the light, which is put out when someone abruptly throws a potato at it, thus accomplishing yet another clever variation on the sequence. Hero (a character familiar with his environment): Yeah, this is boring. Fade in to a quiet scene with the two characters. Surrounding them are a lot of stuff, although they are piled up quite neatly. The hero and sidekick are looking into the telly, rapidly switching channels around. They finally stop when a clip of Toy Story catches their eyes. The programme turns out to be a documentary on Pixar. Hero: This is some sort of ... documentary. What is this about? Narrator (on the television): The company that produced Toy Story was a little-known company named Pixar Animation Studios, in Emeryville, California. A pause, as the semi-serious rapid character exposition draws to a close. Hero: Yeah, this is boring. Sidekick: I think so too. You want to go outside and run around frantically for no reason? Cut to an exposition montage. Superimpose titles as a theme, hopefully by Randy Newman, plays. Superimpose logo with imagery related to the subject matter, cleverly integrated into the name of the movie. Everyone is still running around outside, until they stop and rest under an idyllic shade cast by an idyllic tree. Hero: So where did this Pixar come from? Sidekick: It was actually part of Lucasfilm until Steve Jobs bought it out. Sidekick: You wouldn't understand. Then they entered into a partnership with Disney, and made Toy Story. Since then, they've been making really good movies. Except Cars. That one was just horrible. Hero: No, you did not just say that! Sidekick: Yes, I did, and I stand by it. Suddenly the hero is pulled out of his surroundings by a mysterious hand. Hero: What's happening? Hey! Let me go! The sidekick's expression turns into a resolute one. Sidekick: I'm going to go and look for him, even though he'll probably go and rescue himself anyway. Human: As if how evil I am wasn't obvious enough, I'm wearing a black T-shirt with a skull. The hero wakes up, still somewhat dazed and confused. Human, a higher power: Hellooo! Human: I picked you up a few moments ago. Did I hear you scream? I'm pretty sure I didn't hear you scream. Hero: I just want to go back to my comfortable environment! Human: Well, I don't think you're talking. You're just a character. 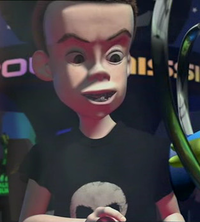 I mean, it wouldn't kill you if I talked about Pixar's recurring motifs. Hero: NO! That'll be MURDER! Human: I had better start now. Dysfunctional relationships often cross all bounds. This is often thought to be the reason for their dysfunction. 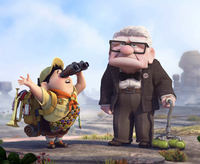 Pixar's movies tend to feature at least one dysfunctional relationship between main characters. This could be because of a language barrier, a physical difference, a philosophical difference or culture shock. This is often played out for comic relief or plot advancement, or both. Typically such a relationship will cause conflict, often over something as silly as arguing over whether Cars was that bad. In the end, however, everyone makes peace with each other in an utterly contrived heel face turn that should really be limited to South Park. Human: Before this, however, the conflict also causes the next motif. Colour is often contrasted greatly between the hero and his unfamiliar surroundings. Also often contrasted are eye expressions. Pixar's movies also tend to have main characters who are displaced from the environment they are familiar with, typically by an entity with higher powers. The hero tends to be displaced into a bigger world; a toy could be cast out into the real world, a superhero into the normal world, an Earth robot into the rest of the universe. Normally there is a language barrier between the two, although whether this gets resolved depends on how the relationship progresses. The characters try to adjust to it, but thankfully they don't have to stay there in their alienated state for long, thanks to a largely highly lucky and obviously contrived series of events. Hero: You had better make sure that I don't stay here for long either! Human (oblivious to the hero): There's one last thing I should talk about. Typically the protagonist's sidekick will attempt to aid in rescuing him. The sidekick may even assemble an entire team for his effort. However, these efforts will only end up causing more trouble. Sidekick: Oh, I'd better stop. This, for whatever reason, has positive effects for the hero. Behold John Ratzenberger! I am always in a lesser role than you, but no role is lesser than mine! 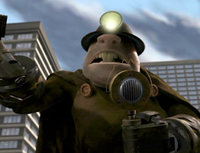 There's also a guy named John Ratzenberger who does cameos in every single Pixar movie. Passer-by, played by John Ratzenberger: Yup, this is the highlight of my career. Hero: Wait, what about Cheers? Passer-by: Cliff Clavin? That was a complete failure! I didn't even get my own spin-off! I mean, the psychiatrist did! Passer-by: What, as the assistant manager of a bathhouse? In an English dub of Spirited Away? Human: What? You want me to talk about Pixar's feature films? Human: All right, here we go. 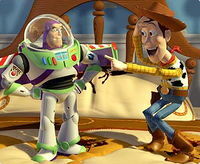 Woody laughing at Buzz prior to trying to take him out. 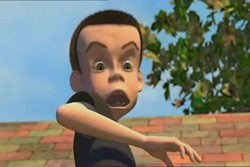 Pixar's first film was Toy Story. 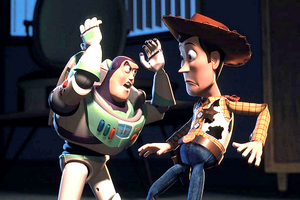 Woody, a character familiar with his environment, forms a tense relationship with Buzz, when they get taken away from their surroundings. They behave like fish out of water until, by a very lucky series of events, they escape certain death and return to warm welcomes. 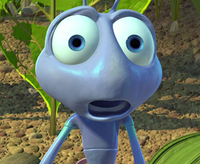 Flik looking stunned at the sheer mediocrity of this movie. Their second film was A Bug's Life. Flik, a character familiar with his environment, forms a tense relationship with a circus troupe, when they are exiled from their insect colony. They behave like fish out of water until, by a very lucky series of events, they escape certain death, fight off grasshoppers, and all return to warm welcomes. Rex imitating Buzz in a cruel mockery of his wardrobe. Their first sequel was Toy Story 2. Woody, a character familiar with his environment — you remember him, right? — has formed a pretty good relationship with Buzz, but gets taken away from his surroundings. He behaves like a fish out of water until, by a very lucky series of events, he escapes certain auctioning, gains new friends, and returns to warm welcomes. 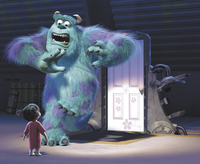 Pixar's next big film was Monsters, Inc. Boo, a character familiar with her environment, has formed a tense relationship with Sulley and Mike after being taken away from her world, but all of them are exiled from their surroundings. They behave like fish out of water until, by a very lucky series of events, they escape certain death and return to their respective worlds. Finding Nemo was the only movie in which the expression "a fish out of water" was taken rather literally. This may account for the massive success of the movie. Pixar's next film was Finding Nemo, their biggest hit. 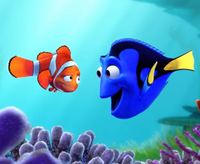 Nemo, a character familiar with his environment, has a tense relationship with Marlin, his father, when he gets taken away from his surroundings. He literally behaves like a fish out of water until, by a very lucky series of events, he escapes certain death and returns to warm welcomes. 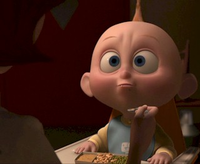 Jack-Jack Parr's superpowers appear to include cuteness. Pixar's sixth film was The Incredibles, their second biggest hit. Mr Incredible and Elastigirl, characters familiar with their current statuses, have a tense relationship with each other when they get taken away from their superhero work. They behave like fish out of water until, by a very lucky series of events, they escape certain unemployment and death, and return to superhero work along with their children. Let's pretend that never existed, on second thought. 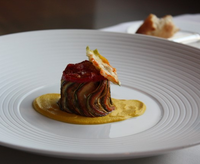 Pixar's third Academy Award-winning film was Ratatouille. Remy, a character familiar with his environment, has a tense relationship with his fellow rats when he gets taken away from his surroundings. He behaves like a fish out of water until, by a very lucky series of events, he escapes certain death and becomes a celebrated puppeteer chef. EVE was feeling very lucky at the time this picture was taken. 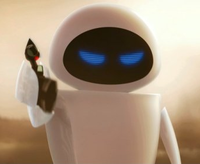 Pixar's Academy Award-robbed film, WALL-E, won only one of six nominations. WALL-E, a character familiar with his daily routine, has a tense relationship with EVE when he gets taken away from his bleak Earth. He behaves like a fish out of water until, by a very lucky series of events, he escapes certain "death" and prompts humanity's glorious return to a completely dead planet. Russell taking an uncomfortably close look at his role model. Yet another Academy Award-winning film by Pixar, Carl, a character familiar with his life, builds a tense relationship with Russell when they get taken away from their mundane surroundings. They behave like fish out of water until, by a lucky series of events, they escape certain death and return to warm welcomes. Pixar's most recent Academy Award-winning film, all of the toys, characters familiar with their environment, have increasingly tense relationships with each other until they all get taken away from their environment. They behave like fish out of water until, by an incredulously lucky series of events, they escape certain death and end up in the hands of a saccharine conclusion to a nostalgia trip. A sequel to a nonexistent film? How? Human: But I was going to talk about how Pixar did effects for Star Trek II! Human: Now, let me talk about the short films, and we'll move on to future projects. Hero: NO! LET ME GO! Hero: Great. I wish I'd done that earlier. Hero: Now I've got to get out of here, back to my familiar environment. I wonder if that rather large sheet of paper conveniently placed right beside me could help. A moment later, defying all laws of physics (since this is a children's movie anyway, nobody cares), the hero is gliding on a sheet of paper. But suddenly, he notices that he is about to crash into a wall. At that very moment, out of a contrived coincidence, a mattress falls down to cover the wall completely, and our hero suffers little or no injury, landing safely back in his environment. Hero: Well, that was certainly far too lucky. I'll have to spend the rest of my life doing good to everyone else. Sidekick: And you'll start by admitting that Cars was horrible. Hero: Not on my life! After a seemingly awkward pause, the two break into laughter, and with this the movie ends on an optimistic fade out. A fancy end credits sequence plays as the main characters zoom back and forth across the screen, even though nobody is likely to see it. 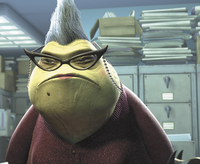 An equally effective tactic is to walk into the Pixar offices and throw the script randomly behind the receptionist. This will have the equal effect of your idea being ignored. As you are doubtless aware by now, any Uncyclopedian can make a Pixar movie. Specifically, any Uncyclopedian can make every part of something resembling a Pixar movie, except for the entire animation portion of the process. However, this remainder still includes dialogue, motifs, and the entire script—all important parts of a masterpiece. Below is a template for outlining potential plots for movies. After substitution and tweaking, you can send this to Pixar Animation Studios, 1200 Park Ave, Emeryville CA 94608, USA, where your proposal will be kept in a filing cabinet designated "LAST-RESORT IDEAS". Alternatively, you could begin writing a full-fledged script, and send such a script to the same address, in which case your screenplay will be kept in a different filing cabinet, designated "LAST-RESORT SCRIPTS". [HERO NAME HERE], a character familiar with his environment, has a [RELATIONSHIP TYPE HERE] relationship with [SIDEKICK NAME HERE] when [HE IS/THEY ARE] taken away from their surroundings. [HE/THEY] behave like fish out of water until, by a lucky series of events, they escape certain [DEATH/AUCTIONING/CAKE/OTHER FATE] and [SIDE CONSEQUENCE OF HERO'S ACTIONS HERE]. This page was last edited on 23 December 2016, at 07:26.